Thoughts: I bought a LOT of music in the early 1990’s. I was in college, and living in the dorm across the street from Cut Corner Records in Lexington, KY. They sold a lot of used stuff there, and had a large selection of used vinyl in their “Record Cellar,” – much of it for $1 or less. I had grown up on a steady diet of classic country music (around my house, it was mostly Johnny Cash and Loretta Lynn), only discovering other genres as a young teen. I was guided in this discovery mostly by the emerging college radio scene, and Rolling Stone magazine. Armed with copies of their Top 100 albums list (two lists: the 1980’s and all time), my friends and I would pick through these used records, trying to gather as many as we could afford. 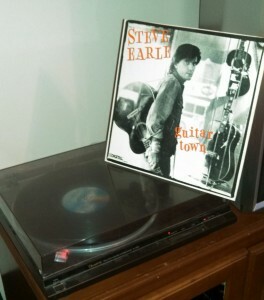 This is how I came to own a copy of Guitar Town by Steve Earle, which was #79 on the 1980’s list. Of course, being from a country home, I was familiar with the title track on Earle’s debut album. “Guitar Town” had been a top 10 hit for the breakout performer in 1986. Earle manages to craft an album that can legitimately be considered “country-rock,” as opposed to the many, many acts who are country in name only, churning out thinly-veiled pop. The rest of the album is just as gritty. Earle’s songs are grounded, honest narratives, full of the blues and twangy country. This is roots music. And it’s pretty damn good. I mean, just listen to this. But Guitar Town is much more than its title track. “Hillbilly Highway” pairs great with that hit tune, continuing the theme of traveling on a long journey to the big city, trying to hit it big. Earle was really writing about what he knew. Another favorite of mine is the last song on side 1 – “My Old Friend the Blues.” This is classic cryin’ in your beer country, and I absolutely love it. This is simply one amazing country debut album. In fact, it would probably have been the best first country record that year – if not for Lyle Lovett’s eponymous album. In more recent years, Earle has garnered a lot of negative attention for his songs and political statements regarding everything from the war on terror to the death penalty. Yes, he’s a flaming liberal, and an outspoken one at that. I don’t really give a damn – he makes good music…or at least he did back in 1986. Album Art: The artwork is fairly straight-forward – a grainy photo of Earle standing outside the window of a guitar shop, his six-string slung over his shoulder. It’s clearly meant to show the struggling young singer just off the bus, trying to get started in a town that chews up new talent. The message is clear: Steve Earle has arrived in Nashville. My copy has a clear plastic inner sleeve. I’m not sure if this is original, or if it was a replacement for a lost sleeve.